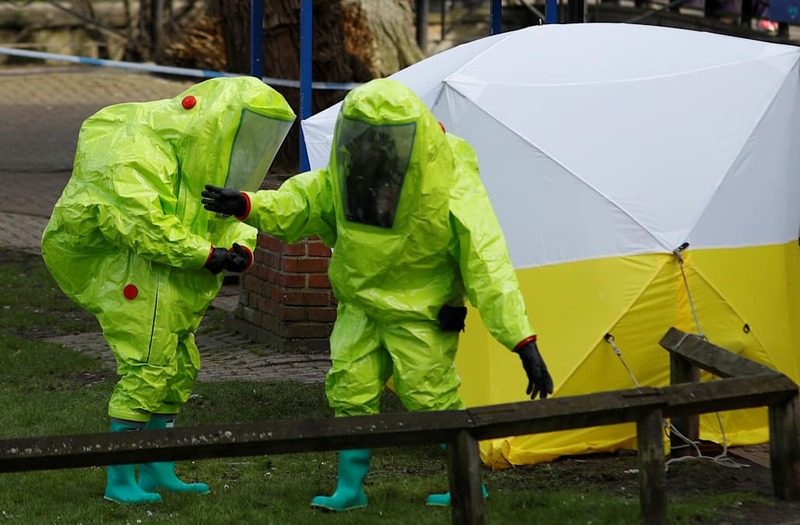 A police sergeant who assisted a former Russian spy and his daughter after a nerve agent attack in Britain is receiving medical treatment, as well as 18 other people who may have been exposed to the poison, police said Thursday. The attack on Sergei Skripal, 66, and his daughter, Yulia, 33, is being treated as attempted murder, authorities have said. The two remain hospitalized in critical condition after being found unconscious Sunday on a bench near a shopping mall in Salisbury, 90 miles west of London. Sgt. Nick Bailey, an officer from the Wiltshire police who assisted the two victims, also remained hospitalized on Thursday but appeared to be making progress, said Kier Pritchard, the acting Wiltshire police chief. "Of course he's very anxious, very concerned," Pritchard told reporters. Some of those who were treated after the nerve agent attack received blood tests, support and hospital advice, Pritchard said. He would not say whether the other victims were other officers, medical workers or bystanders. At a news conference, Britain's home secretary, Amber Rudd, described Bailey as "still seriously unwell," but "engaging and awake and talking to point." Police have not offered any specifics about the attack, including the type of nerve agent used or how it was delivered. Skripal, a former military intelligence officer, was sentenced to 13 years in prison in 2006 after being convicted in Russia of spying for Britain. He passed the identity of dozens of spies to the United Kingdom's MI6 foreign intelligence agency, according to news reports. He was freed in 2010 as part of a U.S.-Russian spy swap that also included Anna Chapman, who was arrested in New York earlier that year. The incident has drawn parallels to the death of former Russian agent Alexander Litvinenko, who was poisoned with radioactive polonium 11 years ago in London. Litvinenko, 43, an outspoken critic of Russian President Vladimir Putin, fled Russia for Britain six years before he was poisoned. He died after drinking green tea laced with the rare and very potent radioactive isotope at London’s Millennium Hotel. In a report published in 2016, a British judge found that Litvinenko was killed in an assassination carried out by Russia's security services — with the probable approval of Putin. Russia has denied any responsibility for Litvinenko's death. There is no evidence of any Kremlin connection in Skripal's case. But intelligence analyst Glenmore Trenear-Harvey, who formerly worked for MI6, told NBC News that he believes that the case has the hallmarks of Putin's involvement. Yuliya Talmazan and Michele Neubert contributed reporting from London, and Keir Simmons and Nick Bailey from Salisbury, England.